Tottenham's striker Mido will leave the club and return to Roma at the end of his 18-month loan spell. The Egyptian international, 23, was hampered by groin and knee injuries in the latter stages of the season after an impressive start at White Hart Lane. 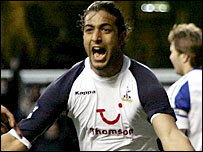 Mido made 28 starts in total for Tottenham, scoring 14 goals. Tottenham have also decided to release Serbia and Montenegro full-back Goran Bunjevcevic and Morocco defender Noureddine Naybet. Mido, though, is the biggest name exit. He had been expected to leave after the recent signing of Dimitar Berbatov.